"Jack is not fond of the bossy narrator of his fairy tale! 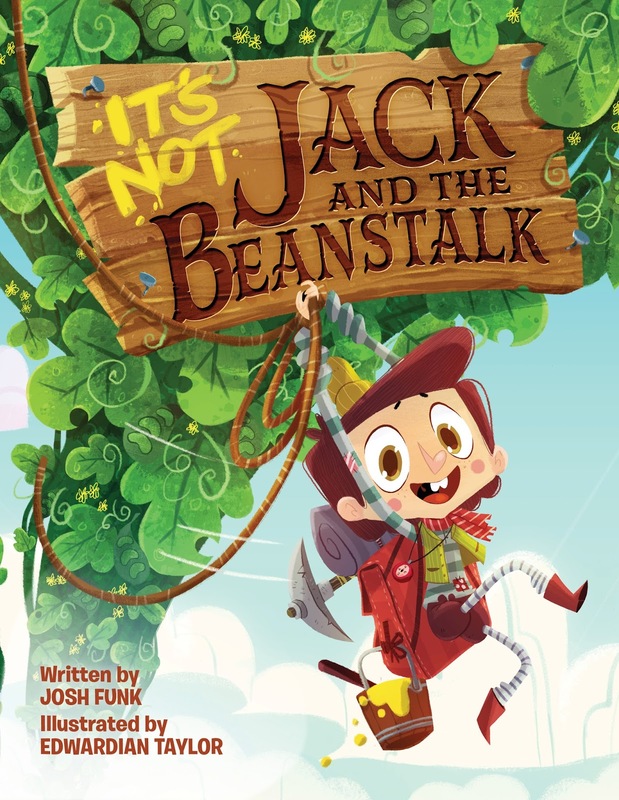 When Jack is told to trade his beloved cow Bessie for some magic beans, throw the beans out the window, climb the ENORMOUS beanstalk that sprouts overnight, and steal from a GIANT, he decides this fairy tale is getting out of control. In fact, he doesn’t want to follow the story line at all. Who says Jack needs to enter a life of daring, thievery, and giant trickery? He takes his story into his own hands—and you’ll never guess what happens next!" 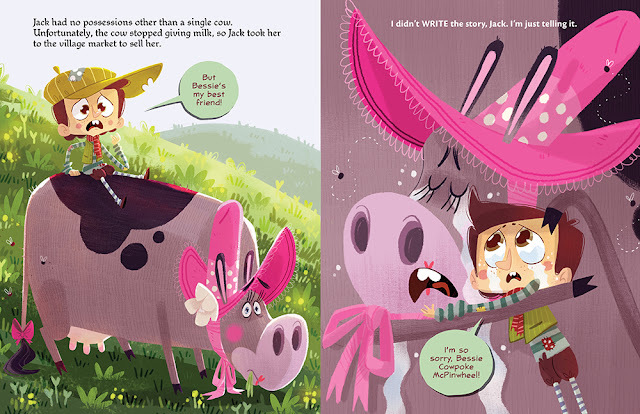 I'm pretty sure I'd cry that hard if I had to give up my best friend, Bessie Cowpoke McPinwheel. Overall, it's pretty easy to recommend this one. It'd be SUPER fun as a readaloud, especially if you had someone helping (one person reading the narrator lines, and the other playing Jack). Check it out! And now to introduce the man of the hour, Mr. Funk! Like Jack, Josh Funk loves telling his own stories. He is the author of the popular picture books Lady Pancake & Sir French Toast and its sequel, The Case of the Stinky Stench, illustrated by Brendan Kearney; Dear Dragon, illustrated by Rodolfo Montalvo; and the upcoming How to Code a Sandcastle illustrated by Sara Palacios in partnership with Girls Who Code. Josh lives in New England with his wife and children. 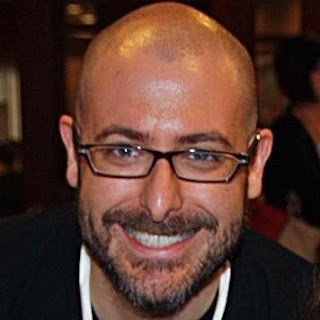 Learn more about him at www.joshfunkbooks.com, and follow him on Twitter @joshfunkbooks. E: Hi Josh! Thanks for doing this interview! J: Hi, Emily! Thanks for having me! As you know, I’ve followed Literary Hoots for a while, so I’m truly honored to be here! Aw, shucks, that's awfully kind of you! Now on to your newest book—a fractured fairy tale! What inspired you to take on Jack and the Beanstalk? A few years back, I was really getting into meta books—books that crossed the fourth wall in some way or another. And I really wanted to write a story where the characters interacted with the reader. While there are certainly some stories where the characters interact with the narrator (Snappsy the Alligator by Julie Falatko and Tim Miller) or books where the authors insert themselves into the story (Chloe and the Lion by Mac Barnett and Adam Rex) or books where the characters are aware that they themselves are in a book (We Are in a Book! by Mo Willems), there were very few where the characters interacted directly with the reader outside the book—and the reader interacted back. One of the best that I found didn’t even have any characters: The Book with No Pictures by B.J. Novak, who happens to be a childhood friend of mine. An added bonus of this book was that it made the reader look foolish when reading it. So I thought that if I were going to write a book where the characters spoke directly to the reader or storyteller, it might help if the characters and story were familiar. That way, when the story doesn’t go as planned, the audience would know. And to make it more entertaining, I figured I’d take a cue from my old friend B.J. and do my best to make the storyteller look as foolish as possible. Ooo, those are all awesome books—I can see why they'd inspire you. Tell us a little bit more about how you developed Jack's character for your version of the story. He seems to be pretty spunky and fun! Jack is that pesky kid who is too smart for his own good. Unlike the Jack in the traditional tale of Jack and the Beanstalk, Jack from It’s Not Jack and the Beanstalk has some common sense. He quickly sees that the ridiculous things the storyteller tells him to do are terrible ideas—so he fights back. Sell his cow for five beans? That’s an awful plan! Climb an enormous beanstalk that magically grew overnight? How does one even ‘climb a beanstalk’? Steal from giant? That probably won’t end well. Ahh, now that's why he's so relatable! Jack is quite hilarious. Oh, by the way, do YOU have a good taco salad recipe? What's your favorite bean-infused food? I think the original manuscript called for chili, which would be my favorite food with beans. But “taco salad” is just funnier (we can thank my editor, Marilyn, for that one!). I don’t think I’ve ever made my own taco salad, come to think of it. But I am a BIG fan of beans. I try to work them into as many books a possible (see the bean avalanche in Lady Pancake & Sir French Toast). Good change—love me some taco salad! So, I did read your bio, and I must admit...how does a computer programmer decide to write children's books in his spare time?? How did you get started? The simple answer: I had kids. And I read to them. A lot. We had a lot of favorite books and they inspired me to try writing my own. So I did. And at first, my stories were … terrible. But I kept working on them. And after a little while, they became … a little less terrible. I didn’t give up. I went to workshops and conferences and networked and followed blogs and kept reading a lot. After several years, my writing was in a place where I was beginning to get some good feedback and positive rejections—and finally, it all came together in the fall of 2013 when I sold three picture books (Lady Pancake & Sir French Toast, Pirasaurs!, and Dear Dragon) and signed with an agent in a two-month period. Where do you get your ideas for your books? You do have quite the variety! Kind of everywhere. I often think about what I’d like to see illustrated by a talented artist, like a pancake and French toast racing around a fridge (Lady Pancake & Sir French Toast). Lots of times my kids give me ideas, like when my son said, “I want to be pen pals with a dragon!” (Dear Dragon). Sometimes I wake up in the middle of the night with a word in my head (Pirasaurs!). Other times I’m inspired by reading others’ books to try something new, like a meta-fractured-fairy-tale (It’s Not Jack and the Beanstalk). And sometimes my agent says something like, “Josh, you’re a software engineer. Why don’t you write a picture book about coding?” And so next spring, I have a picture book coming out called How to Code a Sandcastle in conjunction with Girls Who Code, which is an awesome organization. Basically, I always keep my eyes and ears (and mouth) open to ideas—and always keep a pencil and notepad around to write them down before I forget what they are. Yes! A very awesome organization. I'm very much looking forward to that (as a girl who struggles with code, ha). What's your favorite part about the writing process? Least favorite? There are so many favorite parts—seeing the art for the first time, holding a finished book in your hands—but my favorite thing about the writing process is reading to kids, especially in schools. There’s nothing better than connecting with the true audience of the book—and seeing them laugh. It’s also great when I get to talk to students about writing and see how engaged they are—and hear how excited they remain in the days, weeks, and even months after I visit. Least favorite? It wouldn’t surprise me if most authors answer this way, but the worst part is the waiting. Waiting for an editor’s response to see if they’re interested in acquiring your text. Waiting to see the art for the first time. Waiting to hold the finished book in your hands. Most picture books take a minimum of two years to go from the time when a publisher says, “Yes! We want to publish your book!” until it’s actually on shelves. So without a doubt, my least favorite part: waiting. A tropical island ... or my local coffee shop, Haute Coffee. Awesome, thanks so much for sharing a bit about yourself with Literary Hoots! Thanks again for having me, Emily! Enjoy your taco salad! And let's not forget the brilliant illustrator! Edwardian Taylor currently works as a visual development artist and character designer for TV and animation feature film. His work can also be seen in mobile games, films, and commercials. He is the illustrator of the picture book Race!, written by Sue Fliess. Edwardian lives in Texas with his partner, their three dogs, and seven chickens. Learn more about him at www.edwardiantaylor.com, and follow him on Twitter and Instagram @edwardiantaylor. Hopefully, we can score an interview with him next time. Open to the US only, ends 9/30/2017. No purchase is necessary. Void where prohibited. Literary Hoots and the publisher/publicity department are not responsible for lost, stolen, or damaged items. If you are under 13, please get a parent or guardian's permission to enter. Winner will be chosen randomly via Rafflecopter after the contest ends. Literary Hoots reserves the right to disqualify contestants. Fraudulent activities will be monitored and will lead to exclusion. The winner will have 48 hours to respond to the email, otherwise, we will pick a new winner.